The setting is a plush, private treatment room in London's Harley Street, where Zara Marchant is about to be injected with Botox. But it's not her frown lines she's having frozen or her crow's feet that are being smoothed — instead, Zara is unhappy with her calves and is about to have them slimmed with an extraordinary new treatment. With more than 700 Toys for Tots sites and thousands of donation drop-off points throughout the U.S., the Toys for Tots Foundation runs one of the most successful holiday donation programs in the country. The AAAASF staff is proud to participate. 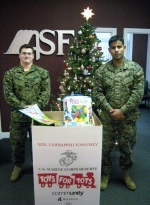 After collecting donations from staff members, AAAASF hosted two members of the U.S. Marine Corps, who visited the office to pick up the contributions on Tuesday, Dec. 16. As of Tuesday, they had collected 60,000 toys — and expected to end the day at 100,000 toys collected. Dermatologist Dr. Francesca Fusco, some are even using Botox to keep their hair looking good. At a recent beauty event, Fusco noted that these women are Botoxing their scalps. It's not to prevent wrinkles, though — they're doing it so they can attend SoulCycle without getting their hair sweaty. The quality of a patient's surgical recovery may be strongly influenced by his quality of life, a recent Mayo Clinic study indicates, suggesting that for lonely, unhappy or overly stressed patients, addressing those issues before they undergo surgery may produce better outcomes. Time magazine recently announced its Person of the Year: the Ebola fighters. This past year a small, microscopic virus showed the world its strength. It spotlighted our deficits in disease control and prevention. The Perioperative Surgical Home model consistently and significantly improves quality of care for patients and reduces healthcare costs, reports a first-of-its-kind, large-scale literature review of the PSH in the United States and abroad. Pain affects more Americans than diabetes, heart disease and cancer combined. An estimated 20 percent of American adults report that pain or physical discomfort disrupts their sleep a few nights a week or more. Common symptoms such as pain or fatigue account for more than half of all doctor's office appointments in the United States — 400 million visits annually. Videoconferencing doctors from other areas could help solve the problem of hospital closings and doctor shortages that hit heavily rural states, but proponents say states move too slowly in allowing it. A survey by Cejka Search and the American Medical Group Association shows physician turnover rates remain high compared with those of recent years. We all know what a problem low back pain is, not only for people who have it but also for the provision of healthcare and for its impact on national economies. Breathing hard, the elderly patient limped off a treadmill in Jacquie Welkener's physical therapy office in Manchester and sat down to rest. Welkener leaned in close, placed a comforting hand to her client's face and said, "Does that feel better?" The patient responded the only way he could. He licked Welkener on the cheek. Temporomandibular disorder is the most common source of orofacial pain of a non-dental origin. Sleep bruxism is characterized by clenching and/or grinding the teeth during sleep and is involved in the perpetuation of TMD. The aim of the present study was to investigate the effects of massage therapy, conventional occlusal splint therapy and silicone occlusal splint therapy on electromyographic activity in the masseter and anterior temporal muscles and the intensity of signs and symptoms in individuals with severe TMD and sleep bruxism. Diseases have long traveled with patients, and as the phenomena of medical tourism and the more general globalization of healthcare grow, these problems are likely to grow as well. The terrifying truth is that Ebola is just the tip of the iceberg. Hospitals in the Indian state of Gujarat have launched a new program aimed at improving fertility for infertile couples. Dubai's medical tourism strategy and an increasing number of local hospitals benchmarking their facilities and services against global best practices have added momentum to the Emirate's emergence as a leading healthcare destination.